(NaturalNews) There are many pathways available for the regulation of the production and conversion of thyroid hormones. Consequently, there are a lot of opportunities for things to go wrong. A healthy thyroid relies on many factors, including, but not limited to, a healthy endocrine system, stable hormone levels, healthy and balanced gut flora, a healthy liver, properly functioning adrenals, healthy kidneys, and clean, healthy blood. Candida overgrowth leads to a host of problems and eventually causes autoimmune disease. It also inhibits the body's ability to properly digest and assimilate nutrition. An overabundance of Candida toxifies the blood in many different ways, which inhibits all gland activity. Hashimoto's disease is a condition where the immune system attacks the thyroid. Autoimmune disorders occur when your immune system produces antibodies that attack your own tissues. This is typically due to a leaky gut as a result of an overabundance of Candida due to poor diet and/or antibiotic use. People with overactive thyroids are often treated with radioactive iodine or anti-thyroid medications intended to normalize thyroid function. Often these treatments result in permanent hypothyroidism (permanent by conventional medical standards). Removing a portion of your thyroid gland will diminish or halt hormone production. A person who wants to balance their hormones after thyroid removal surgery (or partial removal) needs to either take hormones for life or grow back their thyroid. Radiation used to treat cancers of the head and neck can do serious long-term damage to the thyroid gland. Many medications contribute to hypothyroidism, including, but not limited to, medications for mental health, sleep medications, painkillers, and allergy medications. Any stimulant will wear out the thyroid and the adrenals. 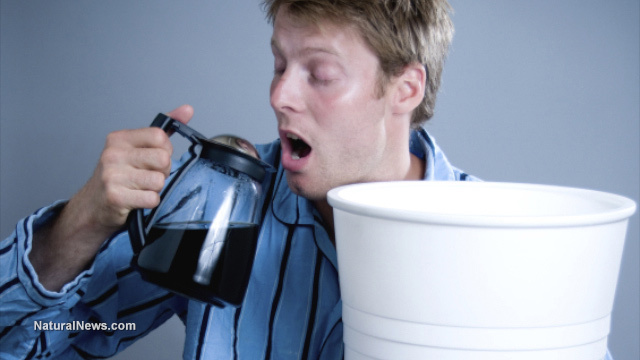 Many people consume a lot of caffeine over a period of time, eventually leading to adrenal fatigue and hypothyroidism. Marijuana disrupts the entire endocrine system, affecting all glandular hormone production. THC, in particular, lowers the immune system's ability to fight infection, and can, with heavy use, lower thyroid hormonal output. Also, smoking anything causes the blood to become thick and toxic with free radicals and carcinogens that clog glands and hinder hormone production. The thyroid gland converts iodine into thyroid hormones. Iodine is a trace mineral found primarily in seafood, seaweed, plants grown in iodine-rich soil, unrefined sea salt, and iodized table salt. Many people do not get enough iodine, and contrary to popular belief, this includes many people in developed countries. Iodine from iodized salt is poorly absorbed and is not a healthy choice for raising iodine levels in the diet as refined table salt contributes to a host of health problems. Iodine is absolutely necessary for thyroid function, but too much iodine (especially iodine outside of food) can impair thyroid function as well. Eating genetically modified foods can trigger autoimmune conditions like Graves' Disease or Hashimoto's Thyroiditis. GMOs destroy the gut lining and lead to a host of problems. Vaccines can wreck havoc on the endocrine system and cause autoimmune issues that can end up attacking the thyroid. Formaldehyde and heavy metal toxins such as mercury and aluminum are huge contributors to the hypothyroidism epidemic. Many studies have concluded that the ingredients in vaccines harm thyroid function. A mouth full of mercury is usually synonymous with a problematic thyroid. Mercury wrecks havoc on the endocrine system, the nervous system, the brain, and well, the whole body. Amalgam fillings absolutely must be removed to restore normal, healthy thyroid function. See the first two sources for more oral health and this issue. Even small amounts of fluoride lessen the pituitary gland's ability to function, which in turn slows thyroid production. Larger amounts of fluoride, which most people do consume from tap water, disrupt the whole endocrine system and wreck havoc on hormone production. Fluoride consumption over time essentially slows the whole body down, including the brain. The thyroid is quite vulnerable to environmental toxins including, but not limited to, pesticides, herbicides, BPAs, jet fuel, perchlorates, thiocyanates, PCBs, lead, chlorine, fluorine, bromine, and many other chemicals we come in contact with that have been proven to cause hypothyroidism. We are bombarded with these chemicals due to the way we construct buildings, the way we produce products, the way we travel, and the way we grow food. Our only defense is high quality nutrition and avoiding toxin exposure through diet, chemical exposure in our environment, and absorption through the products we use for personal care. Less often, hypothyroidism may result from congenital disease, a pituitary disorder, or pregnancy (due to lack of nutrition while pregnant). Weakened adrenal glands lead to the development of thyroid disorders. Adrenal fatigue is often, perhaps usually, the root cause of hypothyroidism. What causes adrenal fatigue? Pretty much the same things that cause low thyroid output. When the adrenals are constantly being worked (due to stress, stimulants, and lack of sleep), an overabundance of cortisol produced by the adrenals will cause a host of problems and completely unbalance the hormone levels of the body. For instance, cortisol can also inhibit proper T3 utilization. When the adrenal glands are performing poorly for a long enough period of time, the body ends up in a state of catabolism; the body begins to break down. Eventually, the adrenals will "crash" and cortisol levels fall well below optimum levels. This is adrenal fatigue. Truly healing the thyroid typically requires healing the adrenals or the entire endocrine system. Be sure to read Kill Candida, because an unbalanced ecosystem is the most common precursor to disease, including hypothyroidism. The thyroid will not heal unless the digestive system is healed. Also, be sure to check out Understand Hypothyroidism - Prevention and Natural Remedies and Natural Remedies for Adrenal Fatigue.